Emergency Nutrition Network (ENN) is funded entirely by grants and donations. Most of our work is currently funded by Irish Aid (across all activities) and DIFD (knowledge management support to the SUN Movement). 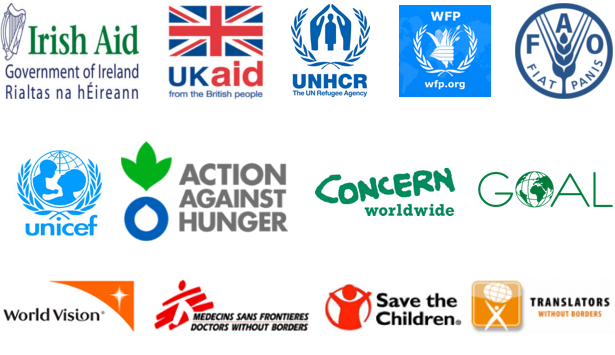 Several United Nations agencies (UNHCR, WFP, FAO) and non-governmental organisations (Action Against Hunger, Concern, GOAL, MSF, World Vision and Save the Children) contribute funding to support our publication, Field Exchange. ENN also partners with Translators Without Borders (TWB) on the translation of both our our publications, Field Exchange and Nutrition Exchange. ENN has also enjoyed consistent funding for the translation of two issues per year of Nutrition Exchange into Spanish and Arabic from the UNICEF Latin America and Caribbean Regional Office (LACRO) and the Middle East and North Africa Regional Office (MENA). Both offices also support the dissmenation of Nutrition Exchange in their respective languages. We greatly appreciate – and need – the support of a range of external donors to enable our work. There are many reasons why you should consider funding the ENN and lots of ways you can do so.